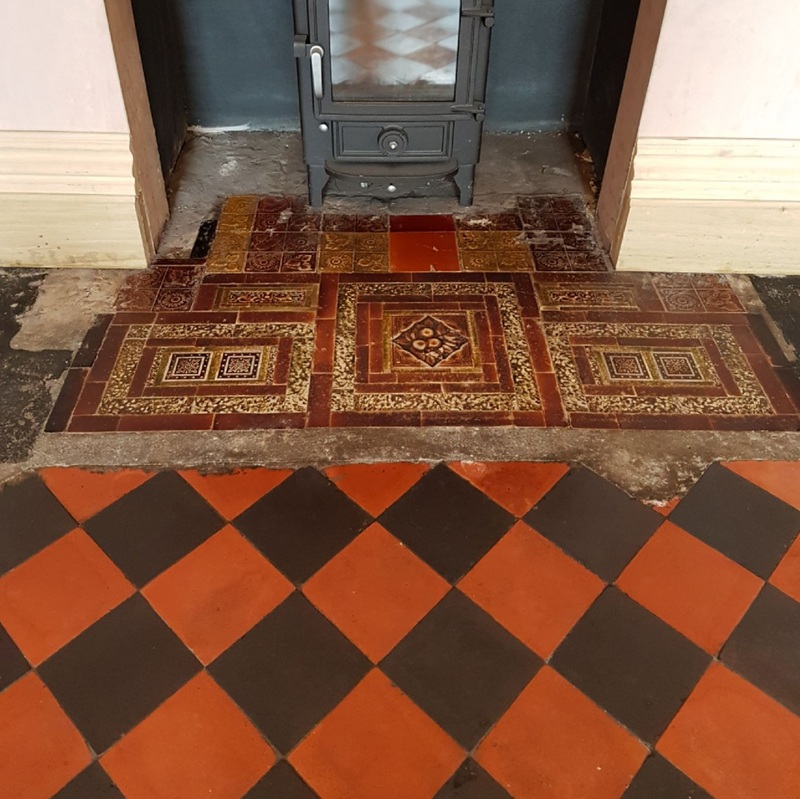 This was an unusual Quarry Tiled Floor that I was asked to renovate at a house in Whaley Bridge which is a small town in Derbyshire Peak district. 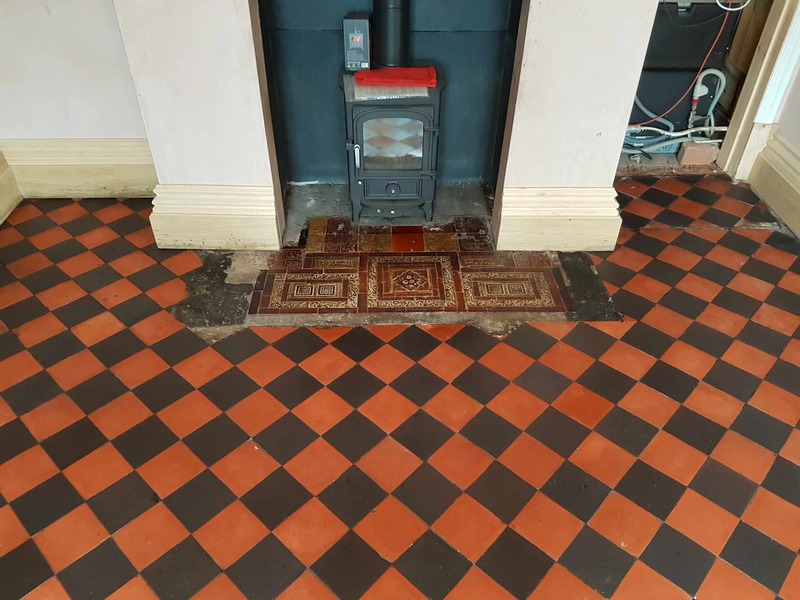 The floor tiles were laid in a diamond pattern using alternating Black & Red quarry tiles. The house was more than 100 years old and recently changed hands. A large rug had previously occupied the middle of the floor and the tiles around the side has been painted over with black paint. To restore the floor to a consistent appearance I could see the paint would need to be removed and then the whole floor given a deep clean and seal. Additionally, there was an old Fireplace at one end of the room decorated in antique Ceramic tiles that needed cleaning, the Tiles are very old but in good physical condition for their age. My first task was to remove the black paint and years of ground in dirty by treating the tiles with a poultice made from two Tile Doctor products namely Nano-Tech HBU Remover and Remove and Go. Working in sections the solution was applied to the tiles and left to soak in for a good twenty minutes before scrubbing with a rotary machine fitted with a black scrubbing pad running at slow speed. The resulting soil was extracted using a wet vacuum and then the tiles rinsed with water, so I would see where more work was needed. Stubborn stains were then spot treated with the same process before moving onto the next section. The Ceramic tiles in the fireplace hearth was treated in the same way. After removing all the dirt, stains and paint I gave the floor a final rinse to remove any trace of cleaning product and extracted as much moisture as possible using the wet vacuum. The floor would need to be dry before applying a sealer, so to allow the floor to fully dry off I left the floor for two days. On my return I checked the tiles first to ensure they were dry. All was good so I set about applying a couple of coats of Tile Doctor Colour Grow which is a colour enhancing impregnating sealer that occupies the pores in the clay. Additionally, Colour Grow is a breathable sealer which is important for these old floors that don’t have a damp proof course. There was no need to apply the sealer to the ceramic tiles in the hearth however as they won’t take a sealer due to the glaze. 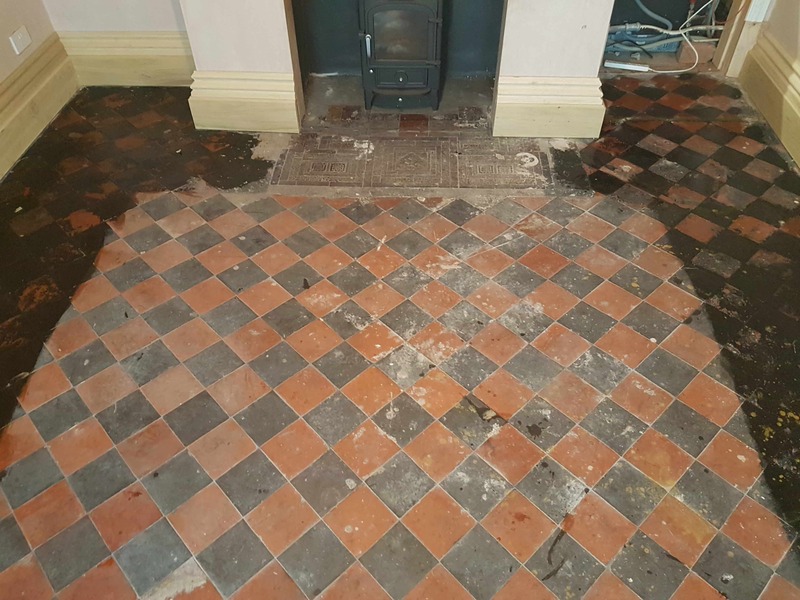 Once completed the floor looked completely transformed and the client was more than happy. 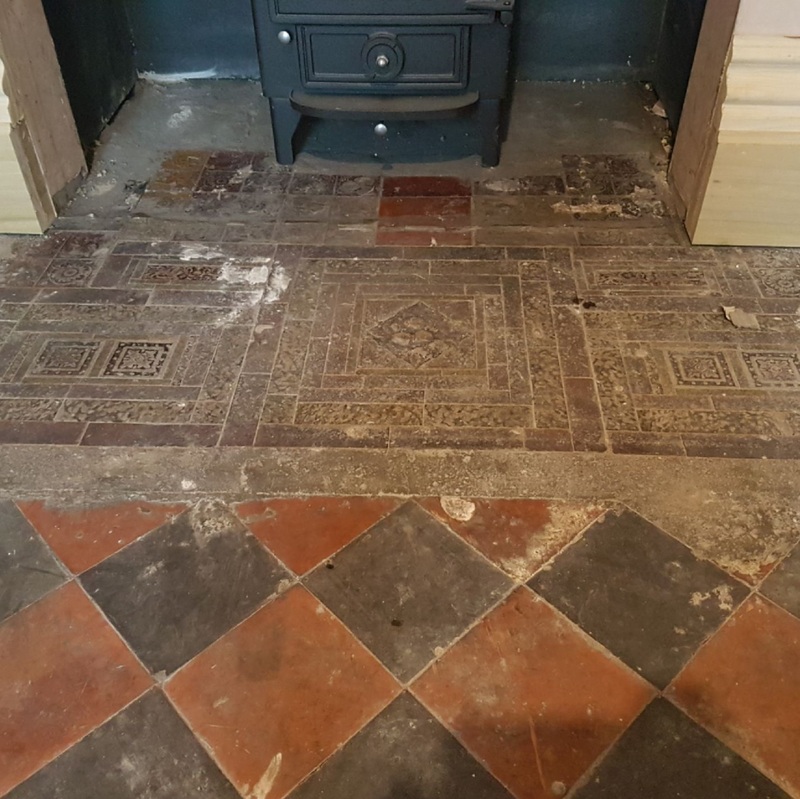 Work continues in other parts of the house and once they have finished decorating they have asked me to return to restore their beautiful old Victorian tiled hallway.